CEDIA EXPO 2011: Kaleidescape serves up best movie Scenes | What Hi-Fi? 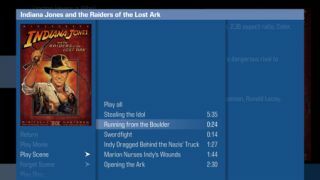 Kaleidescape has updated its movie-server system with Scenes, which enables users to play more than 4000 classic moments from over 700 popular films. Designed for when you just have time watch some favourite scenes rather than a full movie - or maybe when you want to show off your cinema system to friends - Scenes is based on a growing database of key moments picked by the Kaleidescape team. The Scenes update is available now, via an automatic update to all Kaleidescape users. Also on its way as an software update is CinemaScape, which allows Kaleidescape users with 2.35:1 (cinemascope) projectors/screens to automatically fill their screen with all their movie information, without any lens shift being needed. Not only does this mean more of a user's movie collection can be on display (CinemaScape fits in 12 more titles) but that extra information - director, actors, genre, year of release, rating and runtime - can be shown all at once. Meanwhile, Kaleidescape users will soon have a new way to control their movie collections - an iPad app due in the ITunes Store from next month. The free Kaleidescape app will allow users to browse their while still watching movies on the main screen, plus monitor - and control - what's being played on all screens in a multiroom set-up. We'll be talking to Kaleidescape more later this week about its plans for the UK, where it looks as if we'll follow the US move to allow consumers to back up their own Blu-ray and DVD content - something that could see movie servers becoming a hot new (legal) home entertainment option back in Blighty.